Let’s look at the particulars: On Sunday, US warplanes bombed a Syrian military base east of Raqqa killing three Syrian soldiers and wounding thirteen others. The incident took place in the village of Ayyash in Deir Ezzor Province. Coalition spokesman US Colonel Steve Warren denied US involvement in the deadly raid despite the fact that the UK-based Syrian Observatory for Human Rights confirmed ‘that the air strike hit the military camp’. 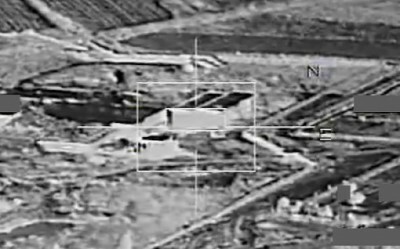 According to the observatory, ‘This is the first time that a strike from the US-led coalition killed Syrian government troops.’ Warren’s denial, which is the reflexive Pentagon response to any claim of culpability, suggests that the attack was a deliberate provocation intended to trigger retaliatory strikes from Russia that would, in turn, justify a larger commitment of US troops and weaponry to the 4 and a half year-long Syrian war. Whether the airstrikes got the greenlight from the White House or from rogue elements acting independently at the Pentagon is unclear. What is clear, however, is that the attack on Syrian troops, a full 30 miles from their designated target, was no mistake. It’s also worth noting, that according to South Front military analysis, the US bombing raid coincided with a “a full-scale ISIS offensive on the villages of Ayyash and Bgelia.” In other words, the US attack provided sufficient air-cover for ISIS terrorists to carry out their ground operations. “Today’s reality is that Iraq and Syria as we have known them are gone. ….. Rather than striving to recreate the post-World War I map, Washington should recognize the new geopolitics. The best alternative to the Islamic State in northeastern Syria and western Iraq is a new, independent Sunni state…. This Sunni state proposal differs sharply from the vision of the Russian-Iranian axis and its proxies (Hezbollah, Mr. Assad and Tehran-backed Baghdad). Their aim of restoring Iraqi and Syrian governments to their former borders is a goal fundamentally contrary to American, Israeli and friendly Arab state interests…. Like we said, the Bolton piece is just one of many articles and policy papers that support the partitioning of Iraq and Syria and the redrawing of the map of the Middle East. ISIS, which is largely an invention of western Intel agencies and their Gulf counterparts, is a critical component in this overall plan. By situating a terrorist organization at the epicenter of world oil supplies, one creates the rationale for intervening in the affairs of other sovereign nations whenever one chooses. This helps explain this week’s bombings in Ayyash and Al-Khan in north-eastern Syria. The US justifies the attacks by waving the bloody shirt of “ISIS, when in fact, the US is merely pursuing its own narrow strategic interests. And while the US has not formally established a no-fly zone in the area, it’s clear now that there are greater risks associated with operating in east Syria then there were just week ago, which is precisely the message the Pentagon wanted to send. That’s it? 5,000 US soldiers died fighting in Iraq and all McGurk can say is ‘You really shouldn’t do that, Turkey’? Keep in mind, Washington hasn’t levied sanctions onTurkey, attacked its currency or financial markets, or threatened it with it with war as it did with Russia. In fact, Obama hasn’t even scolded Turkey. He’s simply looked the other way and ignored the matter altogether. Naturally, that’s incensed US ally in Baghdad, Iraqi Prime Minister Haider al-Abadi, who has threatened to take action if Turkish troops don’t leave in the next 24 hours. Once again, the Turkish move fits perfectly with the overall imperial strategy of “deconstructing” Syria and Iraq and breaking them into smaller, innocuous statelets that will remain in “a permanent state of colonial dependency” for the foreseeable future. “Taking back Mosul in full is on the top of the agenda. For this there is an apparent convergence of interests between Turkey, the Kurdish Regional Government (KRG) and the Western allies….The key figure in the big picture is Khaled Hodja, leader of the Syrian National Coalition (SNC), in close cooperation with KRG leader Masoud Barzani. It was he who declared that there would be a joint combat force built in the canton of Rojava. A colonel, speaking anonymously to Tunca Öğreten with the Diken news site in İstanbul, confirmed the plans, adding that it was a formation initiated by the US and Turkey and that it would consist of around 5,000 men. Idris Nassan, the deputy foreign minister of Kobani, claims that this new force would consist mainly of members of the groups Ahrar al-Sham and al-Nusra, and Turkmens.